"I really hope we get less Barbara." "Not like this, Gotham! Not like thiiiiiiiiiiiiis!" When you fall on your knees, make sure you do it while throwing up jazz hands, for extra stealth. As long as we're piling on Selina: why does she wear goggles up on her forehead, anyway? Ah, I kinda like Selina. Overall, I thought this was a good episode, continuing the recent trend. Unlike Office Space Fight Club, it felt like this successfully integrated the cop drama into the larger story. But even so, this was a lot of fun to watch. I like this take on Harvey Dent -- an alarmingly intense dude who immediately pings on Gordon's radar as a bit of a nut, good guy or not. The idea that he's pretty close to being Two-Face already is promising. I'm getting kind of a Bates Motel vibe from him. Similarly -- and more importantly to the show -- did I miss something that led Oswald to that apartment? Did he just go there on an unrelated clothes-sniffing mission and stumble onto a greater secret or what? Oswald and what's her face are both living in Falcone's house now, right? Her as a spy and assassin and him as a kept minion? >As long as we're piling on Selina: why does she wear goggles up on her forehead, anyway? Hellboy cosplay? Burning man? Batcave spelunking? Oswald is still a double agent for Falcone, everyone thinks he's working for Maroni. It will be interesting to see if Oswald tells Falcone about his discovery... he may be playing a double agent, but you get the sense that he's really working for himself. Wouldn't be great if this Barbara wasn't the real Barbara, but an earlier dalliance with the same name? I really like David Mazouz as Bruce. He's great with Alfred, and he's great with Selina. It's rare to find a child actor who can actually carry a scene like he does. Although the problem is how long he stays a child... How old is Batboy supposed to be, anyway? I would guess 11, maybe 12, and the actor is 13. Kittengirl I'd take for about 13 on screen; the actress Camren Bicondova is 15. It's sort of fun watching her wrap Bruce around her finger but then it's also a bit creepy, pre-adolescent sexuality. I've never once seen a TV show deal reasonably with puberty and I hate the thought of trying to watch Gotham try. The A plot about the mad bomber or whatever was, again, terrible. The formula for a show like this is 34 minutes of episodic TV, 8 minutes of serial drama. 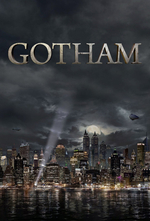 But Gotham is more like 26 minutes of episodic TV and 16 minutes of serial. And the serial is way, way, better than the episode, particularly since Penguin steals every single scene he's in. I like Cat Girl enough that she makes the Bat Boy scenes more tolerable than usual. kittens for breakfast: " did I miss something that led Oswald to that apartment?" He did just learn that Fish had someone close to Falcone but I'm not clear if he narrowed it down any further than that.